"Facts are meaningless. You could use facts to prove anything that's even remotely true!" With all the recent foo-fa-rah about the environment (an issue that I think - and hope - will continue to rise in prominence) and kyoto and such, I thought it would be instructive to look at some choice quotes from the Saskatchewan Conservative Party. "...look what has the government done concerning the Kyoto agreement[....] And now we see through extreme government regulation the NDP are putting more restrictions on the businesses of this province." "We should be sending a clear statement that we reject the implementation of the Kyoto accord"
"So what then is the Kyoto Protocol? Well, Mr. Speaker, it’s not about science. It is crass, old-fashioned politics — socialist politics — intent on redistributing income led by overzealous Environment department bureaucrats." "But the problem, Mr. Speaker, is that the Kyoto Protocol, the Kyoto accord, is a flawed agreement. It’s an impossible agreement, Mr. Speaker." "The Kyoto accord, which this government supported, when fully implemented has the potential to seriously penalize oil and gas development." "Under Kyoto in its present form, those steps are leading down the wrong road. Scientists don’t agree. They can’t assure us that there is a trend to global warming." So they deny the science behind global warming, they claim it is a "socialist" policy dreamed up by environmental bureaucrats to redistribute wealth to poor nations (which they obviously also have a problem with). In terms of the effects on Saskatchewan? According to the Sask Party this "extreme regulation" would have negative impacts, restrictions on business, would impede oil and gas development (gasp) and be a severe impediment to the province. I'm the mouse that Homer kicked. I will make him my political prisoner. Soon, very, very soon. 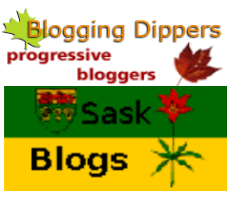 This is my list of Saskatchewan Progressive Bloggers. This list is far from complete and if you have a blog that fits the bill or know of a blog that fits the bill let me know and I will add it.